The US economy continues to recover from the harsh winter weather. 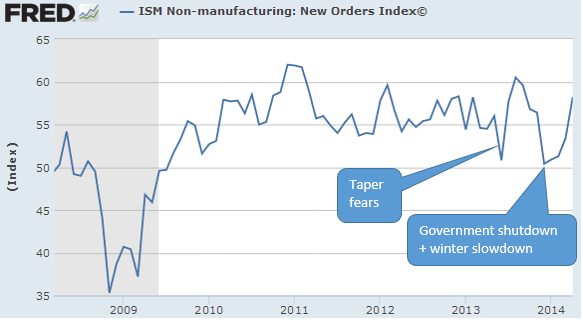 The improvement is clearly visible in the service sector new orders index which came out today. For those who don’t think this winter’s impact was a big deal, consider the extra expenditures on energy alone – cash that went out of consumers’ and businesses’ pockets. The chart below shows natural gas in storage this winter vs. the range over the previous 5-years. Someone had to pay for all that extra natural gas. Not only were companies, households, and municipalities forced to buy this gas, but they had to do so at significantly elevated prices. Furthermore, in the Northeast some of us are still using heating oil which ended up being an even greater cash drain. And we are only talking about the incremental energy expense. Add to that all the missed work, canceled flights and lost retail sales and it adds up to a fairly severe economic shock.